It’s not life’s “illusions” I recall, but life’s infusions ! Tea is my favorite drink. I delight in every aspect of it. The taste and aroma. It’s healthy. The variety is unlimited and the romance surrounding the leaf intrigues me. But the detail I connect with in my heart and mind is the process of “infusing”…. tea is not tea until it has had the proper amount of “steeping”, of “soaking” in hot water ! My life has and is about infusions…you know, being immersed in whatever I am about at the moment….could be cooking with my grandchildren, traveling to Portland to visit our kids, dining in our hometown, moving cows, plowing ground, photography, felting, praying, trying a new tea or dancing with my Sweet Husband of many many years ! My “blog” life is about sharing these past and present infusions with all of you ! I look forward to connecting with you and hearing about your life’s infusions too ! My Sweet Husband and I made a covenant to love and honor one another “in sickness and health, for richer or poorer, for better or worse,” and with the help of God, those vows have lasted over 40 years ! Whew…commitment is a lot of work ! My journey with tea began as a child. My mother would play “tea time” with me, allowing me to have tea with milk. I relived those enchanting childhood memories with my children and now with my grandchildren. 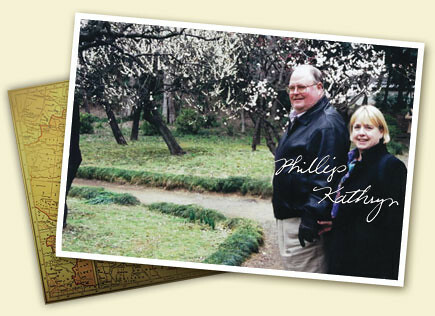 In the 1980’s, My Sweet Husband traveled to other countries with his business. He readily embraced the food and customs from many countries. I was blessed to accompany him on many occasions. In our travels, we have had tea in England, China, Japan, Singapore, and Hong Kong. Our most memorable experience was in Mongolia taking “salt-milk” tea with friends in a ger ( the traditional Mongolian home). In 2006 we opened Oregon Street Tea Company in downtown Redding, California. While the tea room was only open a little over a year, we had an incredible experience ! We miss all of you wonderful people who supported us and we thank you for your continued patronage. Our tea room is now a tea shop on the web. We are meeting more and more fascinating people all over the United States. Kate, what a lovely site! I dearly remember your tea room on Oregon Street, as does my daughter. I would meet with my book club there, and she loved coming along! Now she is a student at Berkeley and I am an empty nester who wants to delve into my long-abandoned hobby of writing. I thoroughly enjoy your blogs, photos, etc. What an interesting life you are living! Thanks, Christina. So happy we’ve connected!